Do you want to create custom dog shirts for your special puppy or best friend? Then you've come to the right place! 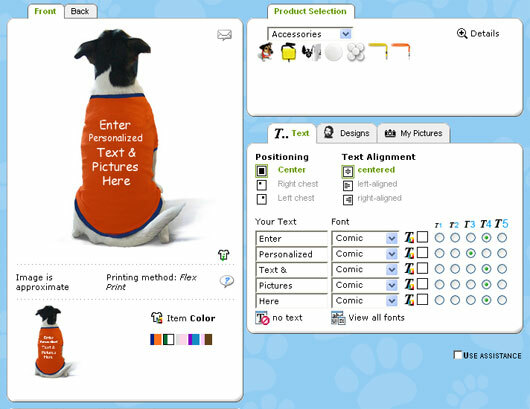 Design your own personalized dog clothes by choosing your shirt color. Then select your text style, color, and size. You can even upload your own image. Get one for your own pampered pooch and another for any other special dog in your life. They make great personalized dog gifts for dogs of all sizes. Click on the customizer below & start designing your custom dog shirts now! Don't forget to create a personalized dog shirt for yourself too!